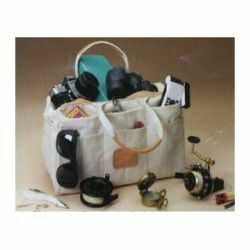 This heavy duty, canvas tote bag is extra sturdy and strong because it is made from 24 ounce canvas, with rolled seam construction. Two levels of handy pockets surround the spacious central compartment which is large enough to accommodate a cordless drill, with accessories. Stow the bigger tools in the center and surround them with all the screwdrivers, pliers, bits, etc. to always have the right tool at hand.